For nearly 70 years, the Apache Band has entertained audiences in East Texas and around the world. If you would enjoy performing great music in a non-competitive atmosphere where you can create life-long friendships, then the Apache Band program is for you! Apache Band membership and scholarships are available to all students who qualify by audition. The band program as a whole performs at a large number of campus, athletic, and community events. 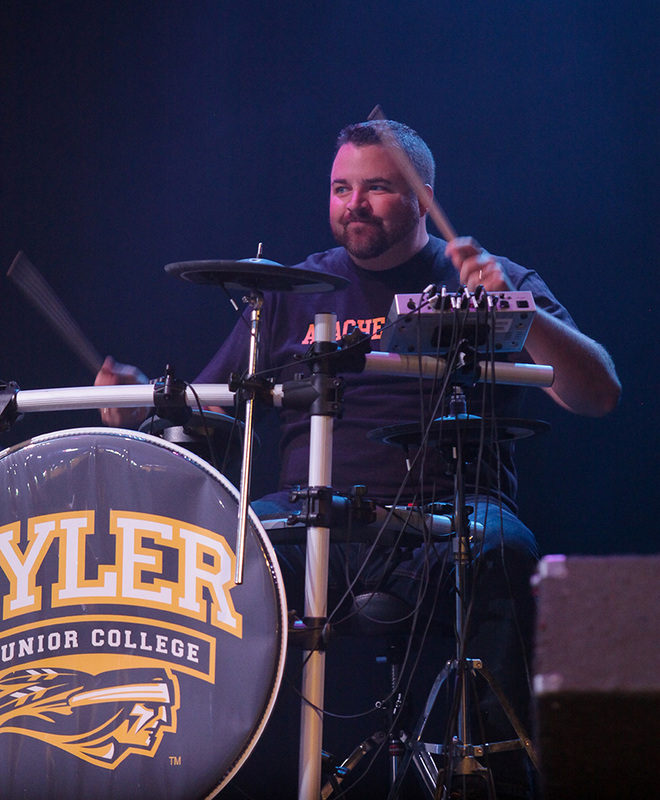 As a member of one of our ensembles you will participate in one of the most exciting and diverse organizations at TJC, taking advantage of musical and social opportunities unparalleled in any other college activity. We hope you will consider adding your musical talents to one of the most exciting junior college band programs in the nation! From rags to swing, latin to rock, funk to fusion, the TJC Jazz Ensembles cover a wide variety of music for any occasion. Currently TJC offers two 18 piece jazz ensembles and a jazz combo. The Wind Ensemble is the premier concert band in the Music Department and is comprised of the most talented wind and percussion instrumentalists on campus. The Apache Punch Drumline (consisting of the battery and front ensemble) is an integral part of the TJC Apache Marching Band. TJC’s Touch of Gold twirling and auxiliary line is a part of the Apache Band. They are known for their exciting and eye catching half-time performances. The Music Department makes up the academic side to the Apache Band and its ensembles. Apache Band Gold is the alumni chapter dedicated to the Apache Band. They're internationally famous for their high-kicking military dance routine!